Once, when commenting about the White House, Taft called it “the loneliest place in the world”. Taft successfully argued for the construction of the U.S. Supreme Court building. He felt that the Supreme Court should distance itself from Congress since it was a separate branch of the government. Prior to then, the Supreme Court heard cases in the Capitol building. At over 330 pounds, Taft was the heaviest president. Once, he got stuck in the White House bath tub and required six aides to pull him free. The tub was replaced with a new one large enough to hold four men. William Taft was the first president to be buried in Arlington National Cemetery. President John Kennedy is the only other president to be buried there. Taft is the only president to ever serve as Chief Justice of the Supreme Court, making him the only person to have ever lead both the Executive and Judicial branches of the United States government. 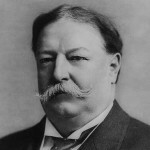 Taft considered his time as Chief Justice to be the highest point of his career, higher than that of being president. Taft is the only former president to ever have sworn in a president. While serving as Chief Justice, Taft administered the Oath of Office to President Calvin Coolidge in 1925 and President Herbert Hoover in 1929. Helps alot with my social studies project! Thx! This helps a lot. I needed it for my American Government project. Thnx, helps me for my project at school! My 4 year old was assigned Taft in his Social Studies class. When he came home with all these interesting facts about this president, I was almost embarrassed to have to double check them here. Thanks for info. Sweet stuff! Thanks a lot my teacher gave me a A+ because of all the facts i gave about william H Taft so thanks again.